The mission of Toccoa Falls College is to cultivate a uniquely Christian learning community that integrates the pursuit of truth with godly character to produce graduates prepared both personally and professionally for service. 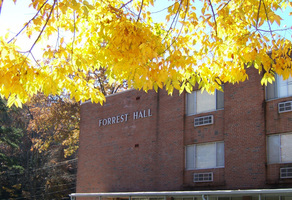 Forrest Hall is a centerpiece for TFC! We have the opportunity to replace the 40-year-old furniture on the 1st Floor of Forrest Hall C-Wing! Make an impact at Toccoa Falls College! Connect with other Screaming Eagles on GiveCampus!